DATE/TIME: January 20, 2019/ 1:30 A.M.
On Sunday, January 20, 2019, Deputy J. Gile conducted a traffic stop in the area of Michigan Avenue and Barton Road, in the city of Grand Terrace. During the traffic stop, Gile observed the driver, Benjamin Adams, attempt to hide a pistol. Adams was detained and the vehicle was searched. 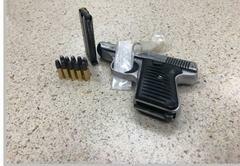 During the search a loaded semi-automatic 22 caliber handgun and suspected methamphetamine were located inside the vehicle. Adams was arrested and transported to Central Detention Center where he was booked for possession of a gun and possession of methamphetamine.